The Dow lost -323 points for the week and this was the fourth consecutive week of losses. Were it not for the nearly +200 point rebound Friday afternoon it would have been much worse. Gustav turned out to be a minor event, oil hit a new five month low and the dollar hit a new 11 month high. You would think those events would be bullish but the trend for the markets was set on Tuesday morning when the gap open to 11790 was sold hard. From Tuesday's high of 11790 to Friday's low of 11037 that represents a -753 point drop. It is no surprise we got a bounce into the close on short covering ahead of the weekend. The ugly economics on Friday that sent the markets into an opening dive was a jobs report much worse than expected. Jobs lost in August totaled 84,000 compared to estimates of 75,000. That was not the worst part of the report. July was revised lower to -60,000 from -51,000 and June was revised from -51,000 to -100,000 jobs lost. The net result was an additional -142,000 jobs lost when you add the worse than expected August numbers. This was the eighth consecutive month for job losses. The unemployment rate spiked from 5.7% to 6.1% and the highest level since Sept-2003. In the separate household employment survey the number of unemployed persons increased by 600,000 in August. The number of people working part time for economic reasons is up by nearly a million year to date. Every sector lost jobs except for government and health care. Employment as evidenced by the government BLS report has dropped by 605,000 over the last eight months and the rate of job loss is increasing. We saw a spike in jobless claims for the week to 444,000 and the trend is definitely rising. For all practical purposes the country is in a recession. Were it not for the stimulus checks over the prior three months and a spike in exports the Q2 GDP would have been a lot lower. Never in the post-World War II period has the job market undergone such a severe contraction without a recession eventually being declared. There are currently more than 9 million people out of work. Analysts were quick to revise their employment estimates and the expected unemployment rate. Deutsche Bank raised their unemployment target to 6.5% in Q2-09. High Frequency Economics warned that their 7.0% prior estimate was too low. Another major bank was quoted on CNBC as saying we could see a peak in 2009 between 8-9%. MKM Partners said they expected the range to be between the 2003 peak of 6.3% and the 1992 peak of 7.8%. 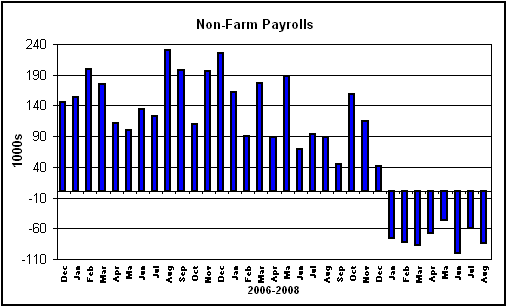 Every analyst was rapidly factoring in much higher unemployment and a rapid increase in job losses by early 2009. Several analysts pointed out that the sudden spike in the unemployment number could be due to the recent extension of unemployment benefits. Initial unemployment benefits last for 26 weeks. When your benefits end you are dropped from the unemployment rolls and you no longer are factored into the employment numbers. When lawmakers recently approved a 13-week extension of benefits many of those still unemployed immediately showed up to file for the new benefits. That puts them back on the rolls and boost the number of unemployed as counted by the ridiculous BLS system. The unemployment rate spiked +0.4% in August and well over the +0.1% analysts had expected. There is precedent for this phenomenon because the same thing happened in April 2002 when benefits were temporarily extended. So, is the number inflated or is it suddenly reflecting reality. Since you have to be unemployed to collect the benefits I believe it simply jumped back into the realm of reality. Being dropped from the rolls of the unemployed just because your 26-weeks expired has never been accurate reporting in my view. After a heavy week of economics the coming week will be a cakewalk. There is really nothing material on the schedule until the Producer Price Index on Friday. The OPEC meeting on Tuesday will be closely watched but nobody expects any changes. OPEC does not want prices to go any lower but they also don't want them to go much higher because of demand destruction. The general consensus is that they will issue a "no change in production" message but privately tell everyone to enforce their existing quotas. Currently OPEC is producing 574,000 bpd over their quotas with the majority of that from Saudi Arabia. By enforcing the existing quotas it will be a cut of 574,000 bpd but that will not be in any announcement. Thursday is the anniversary of 9/11 and markets are likely to be timid on worries of an anniversary attack. The following week is the FOMC meeting and analysts are now expecting a Fed statement that borders on the side of rate cuts rather than rate hikes. Inflation is dropping fast along with jobs. The FDIC closed another bank on Friday. The regulators shut down Nevada's Silver State Bank. It was the 11th failure this year of a federally insured bank. The bank had $2 billion in assets and $1.7 billion in deposits as of June 30th. The cost to the FDIC is expected to be between $450 and $550 million. The bank operated 12 branches in Nevada and Arizona and had mortgage loan offices in seven states as far away as Florida. Any guess why they failed? The assets will be assumed by the Nevada State Bank of Las Vegas. Have you touched your money lately? If you were a big investor with several million in a hedge fund you probably should check to make sure it is still there. The highly visible $4 billion Ospraie fund closure has rattled investors. The firm lost 27% in early August and 39% for the year on losses in the commodity sector. The fund said it was going to return the remaining money to investors. Unfortunately it could take up to two years to unwind some positions. For a highly reputable fund, the largest in the commodity sector to take a 40% hit, and some say it will be more, undermines the confidence in all funds. On Friday Atticus Capital was forced to deny market rumors that it was liquidating and shutting down. Their two main funds have taken losses of 25-32% so far this year. The withdrawal window for Atticus is the end of September and the founder said on Friday they have received redemption requests for less than 10% of Atticus capital. Mitsui and Company, Japan's second largest trading company announced on Friday they are closing their New York hedge fund business due to poor performance. That falling confidence was likely behind the drop in the broader market last week. Most hedge funds have withdrawal rules stating when you can withdraw your money. Some require 45-days notice and limit redemptions to once per quarter at quarter end. Others allow redemptions monthly at month end but all require prior notice. Several analysts have theorized over the last couple days that scared money was leaving those funds with the August month end being a trigger in some cases. In many cases a fund has to produce the money five days after the withdrawal period. If the end of the period was August 29th then Friday the 5th was the last day to pay depending on how they count the holiday. This suggests the heavy institutional liquidation we saw last week was scared money leaving funds and going home. Since most funds are highly leveraged the impact of forced withdrawals is magnified. Most funds are leveraged 3-5 to 1. A $4 billion fund like Ospraie could be controlling $20 billion in positions. Some funds are even more highly leveraged than that and closing positions to raise capital is a major headache. Remember, Ospraie said they halted redemptions because they were seeing a run on the fund. Ospraie was high profile but there are thousands of funds you never hear about. If Ospraie was being raided by investors then you have to bet there are other funds in a similar position. Those in commodities have been hammered. Those not in commodities are probably fairing better but money is definitely leaving town. Let's play with some numbers. If there were only 100 hedge funds of $1 billion each seeing redemptions at the Atticus rate of 10% that would be $10 billion. Assuming there average leverage was 5 times that $10 billion controls $50 billion in positions. Unwinding $50 billion in positions in a bear market would only make that market worse, much worse. Maybe all are not seeing 10% in redemptions but only 3% or 5%. However there are more than 4400 hedge funds. What is 3% of 4400 funds? It works out to a lot of money and a lot of highly leveraged positions to liquidate. Granted not all funds are seeing redemptions. Several funds last week said they were flush with cash and looking for new opportunities. Of course if I were trying to avoid a run on the fund I would be saying the same thing. Bear Stearns claimed they had plenty of liquidity three days before they were taken over by the Fed and JP Morgan. Talk is cheap. Watch the tape for the real story. Another factor hitting funds is the evaporation of credit. Funds borrow money to increase their returns. As the banks continue to make multi billion dollar write-downs it takes capital out of the market. Banks leverage an average of 8:1 to 12:1 so every $1 billion in write-downs takes $8-$12 billion in loans out of the market. Investment banks have leverage of 30:1 like Lehman six months ago. Fannie and Freddie are 50:1. So far in this crisis there have been more than $501 billion in write-downs. Multiply that by you choice of leverage above and see how much credit has been removed from the market. Banks are actively terminating loan commitments and credit lines. When loans to funds roll over they are being eliminated or reduced. That takes a big chunk of party cash out of fund accounts. A major problem here is the deteriorating investor sentiment. Investors are moving back to cash and there is a complete absence of buyers. With the rising rate of bank failures and 117 on the Fed's endangered list you even have to be careful about where you put your cash. The Friday rebound came after rumors surfaced that a couple private equity firms may be interested in buying part of Lehman. Sandler O'Neill reiterated a hold rating on Lehman saying they had plenty of assets to absorb another $8 billion in write-downs. There were also rumors another sovereign fund might take a run at acquiring the company. It was a Friday in a bear market and conditions were ripe for a short squeeze. Once stops started getting hit the rest was history and Lehman rallied 7% by the close and dragged the entire financial sector higher with it. After the close was a different story. The story broke shortly after the close that Fannie and Freddie were going to be taken over by the government this weekend and shareholders might be wiped out. The major news services are all carrying the story on Saturday but still no details. Reportedly Federal Reserve Chairman Ben Bernanke, Treasury Secretary Henry Paulson and James Lockhart, the companies' chief regulator, met Friday afternoon with the top executives from the mortgage companies and informed them of the government's plan to take over the troubled companies in a process known as conservatorship. If the government does take over Fannie and Freddie and places them in a conservatorship according to the WSJ story it could erase the outstanding shares. There are more than $36 billion in preferred shares outstanding and much of it is held by foreign central banks and sovereign wealth funds. Granted they can afford the losses better than common shareholders currently holding 310 million shares. Fannie and Freddie lost about 30% in after hours trading. We had a long discussion in the office about what impact this would have on Monday's market. Some reports suggested the financial sector would rally next week without the FNM/FRE cloud hanging over the sector. Others thought the sector would crash because of the potential loss to shareholders. Most of the individual banks rallied sharply in after hours but there was only a vague press release about a "bailout" of Fannie and Freddie before trading ended. It was not until after all trading had halted that reports began circulating that shareholders could be eliminated. I tend to believe they won't be eliminated entirely because too many banks own stock in FNM/FRE in their capital accounts and eliminating the stock would push these banks into an immediate capital shortage. Late Saturday there was an article making the rounds claiming the government would make quarterly injections of funds as needed to keep the companies solvent and minimize the cost to taxpayers. The cash would be supplied by buying convertible preferred shares or warrants. Some of the articles claim current shareholders would be severely diluted but not eliminated. A takeover of the two entities turning the existing debt into federal debt would be good for the financial system because it would end the speculation on a future failure. Banks around the world would get an immediate bounce with an implied federal guarantee of their investments. Mortgage rates would fall and the government could modify mortgage terms at will to reduce foreclosures. While a dilution or elimination of the common shareholders would be negative anybody still holding those shares today is a speculator rather than an investor. The real long-term investors got out long ago. If they didn't they deserve what they get. For many months there have been warnings that the stock could be erased. Both Fannie and Freddie continue to claim they have sufficient capital to weather the mortgage storm. However, their cost of capital is rising every week as they sell debt for mortgages at increasingly higher rates. The problem is the rapidly rising mortgage delinquency rates. The Mortgage Bankers Association said on Friday that foreclosures hit a new all time high in the second quarter. Total delinquencies rose to 6.41% and well above the high from the 1980s housing downturn. Delinquencies for prime loans were 3.93% and subprime loans were 18.67%. FHA loans were 12.63% and VA loans 6.82%. Delinquencies on prime adjustable rate mortgages rose to 6.78% and 26.77% on subprime. Over 4 million homeowners with a mortgage, a record 9%, were either behind on their payments or in foreclosure. That makes it tough for Fannie/Freddie to run a $5 trillion mortgage business on a 9% national default rate. Fannie and Freddie actually have the better credit loans but they are still getting hit with record defaults. One analyst speculated that the sudden takeover was prompted by $223 billion in bonds maturing at the end of September. The companies are going to have to roll over this debt and the rising rates they are being forced to pay would bankrupt them. If the government is in control those bonds could be renewed at the much lower treasury rate taking a huge burden off the companies. OOther rumors making the rounds on Friday had Altria (MO) preparing to offer $10 billion for UST. UST is a market leader in smokeless products and a logical acquisition for Altria since smoking bans are cutting the number of smokers. UST rallied +$13 (+25%) on the news but Altria said the report was pure speculation. The Semiconductor Index (SOX) fell to a 5 1/2-yr low on Friday on fears the demand for computer chips is drying up as the recession spreads to the rest of the world. 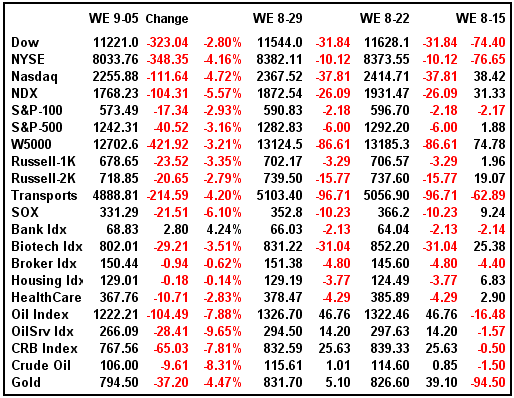 All 13 companies that make up the index were down on Thursday but Friday got a lift from SanDisk (SNDK). Samsung said it might make an offer for SanDisk and the stock shot up +26% to $17. SanDisk said it would not comment on the speculation. 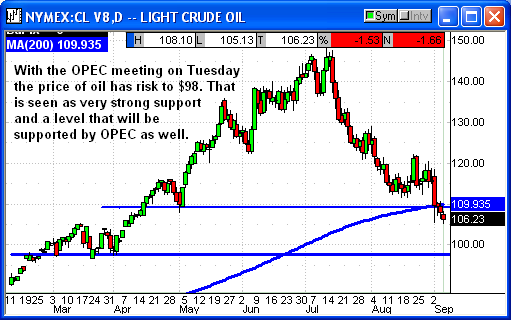 Crude oil closed the week at $106 for a $9.61 drop for the week. The reasons for the drop were said to be the lack of damage from Gustav and the forced liquidation by commodity fund Ospraie and others. 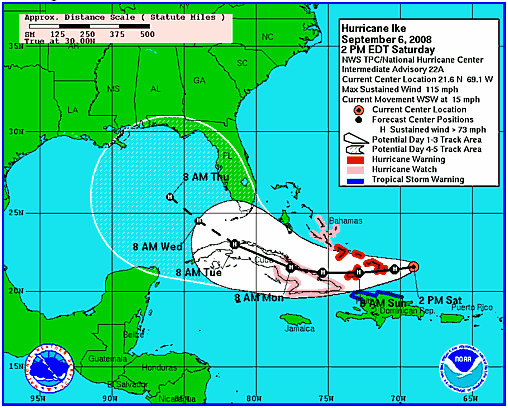 The hurricane traders will get another chance next week. Hurricane Ike, currently a category 4 storm, has altered course and is now headed for a possible landfall just east of New Orleans. About the time those two million people get back to New Orleans and get the power back on it will be time to leave again. It is still too far away to accurately project a path but NOAA is continuing to shift the target farther west as each day passes. As of Friday 90.5% of gulf oil is still offline and 79.8% of natural gas. The Dow fell to 11037 on Friday before the short covering rebound. That level was nothing special with real support at 10950. What this week produced was a clear break of support across all indexes. The rebound was lackluster and ran out of steam when it approached 11200. If the Dow chart was the only chart I had to look at I would be shorting any bounce. 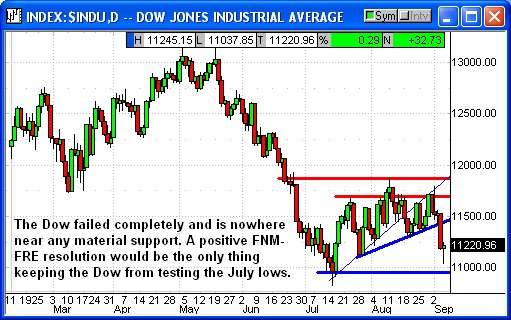 The S&P-500 continued to mirror the Dow with 1200-1215 the next support level. 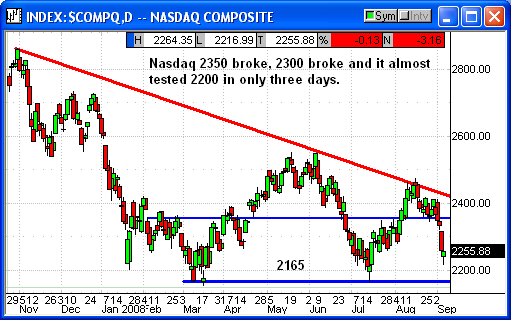 The Nasdaq broke support at 2350 on Tuesday, 2300 on Thursday and nearly made it to 2200 on Friday. All the prior tech leaders were in full decline and several broke through significant support. Good news was ignored and bad news was the focus as we heard repeatedly from companies about softening global conditions. 2200 and 2165 are the next support levels and I would think pretty decent support. Those were the March lows and the July lows. Is the third time the charm? I have been highlighting the Russell 2000 for the last two months as leading the broader markets higher. The Russell clung to its gains until Thursday morning and then imploded. The Russell fell from 742 at Wednesday's close to 702 at Friday's low. 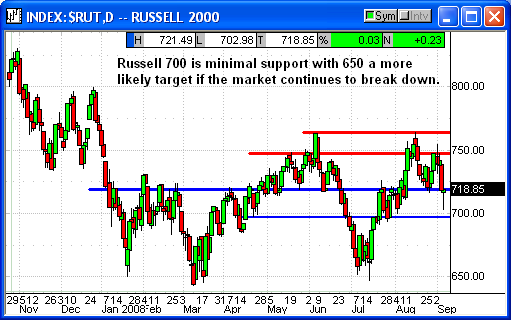 The Russell rebounded on the short covering but came to a screeching halt at prior support now resistance at 720. The 5% drop in less than two days was evidence of fund manager capitulation. They were holding on to their small caps as the rest of the market crashed but finally caved in to the pressure. You may have noticed I have been showing charts of the NYSE Composite index at the beginning of my recent commentaries as evidence of a breakdown in market sentiment before the other major indexes actually broke down. The NYSE collapsed this week and closed on Friday at levels we have not seen since July 2006. It was telegraphing the coming crash and then fell even harder than the other indexes. NYSE 7860, Friday's low was decent support but I don't think it is done. It was simply too oversold for a Friday with bank news in the wind. For the last few of weeks commentators have been telling you not to worry about the market moves because they were occurring on very low volume. That trend changed last week. In the table below you will notice that volume rose almost 50% over the prior week and the majority of that volume was to the downside. When the market moves on high volume you should pay attention. On the flipside of that volume discussion the Volatility Index ended the week at 23. Back during the March lows the VIX hit 35 showing that investors were scared about the future. In the July low the VIX hit 31. At Friday's close of 23 there is almost no fear about a continued drop. It is as if traders are more afraid of missing a bottom to go long than worried that we are going to set new lows. Another reason for the low VIX is the lack of longs in the market. Nearly every retail investor is in cash or puts and mutual fund managers are sitting on piles of cash rather than large long portfolios. Funds with profits are trying to be careful and preserve those profits as cash rather than double down in a bear market. It would seem that everyone is waiting on a bounce with legs rather than trying to catch the falling knife. It is a buyer boycott rather than longs racing to the exits. Historically September is the worst month of the year for the markets. Also, historically the worst week is the triple witching expiration week of Sept 15-19th. Were it not for the Fannie/Freddie news the play for next week would be to continue to short any bounce. The Fannie and Freddie takeover is big news and regardless of the details on the impact to shareholders this should be a positive for the markets. The homebuilders and the housing sector should rally along with banks. Having the government guarantee low interest mortgages will prop up the housing market. The last couple consumer sentiment reports showed increasing interest in buying homes. The problem was the rising rates and lack of available credit to anyone with less than perfect credit. This should lower the bar and the cost for mortgages and take the pressure off housing prices. In order for the current economic weakness to be over the housing sector needs cheap mortgages and available credit. The banking sector needs guarantees that $5 trillion in GSE debt and up to $3 trillion in GSE guarantees is not going to default. That liquefies the debt again and opens up the market for trading. With the government guarantee banks and institutions can again trade the debt among themselves in the secondary market. This debt has been frozen because of default worries and rapidly rising spreads. I believe the bailout in any form will be a positive for the markets. Given the large short interest in the market this could be a game changer for the current trend. If this takeover and full details is publicly announced by Monday all the charts I showed above could be irrelevant. The sentiment boost along with the boost in the banking sector could produce a short squeeze of monster proportions. A little more than a year ago, an old friend made a promise that wasn't kept. Markets had settled into a congestion zone, and everyone was trying to figure out which way the pattern would break. On-balance volume, or OBV, whispered that the break would come to the upside. A Trader's Corner article found at this link included a chart showing how OBV had broken to the upside. Below is that chart, including the original annotations. In this instance, OBV didn't prove to be a trustworthy friend. Am I ready to throw away our friendship? No way. On-balance volume, like all indicators and overlays, can often provide useful guidance. Sometimes, the suggestions offered by OBV, like those of any other usually trustworthy friend, just don't work. Why would OBV normally be trustworthy? OBV calculations require two types of input: volume and price. Many favored indicators require inputs related only to price action, so they're not truly independent of the price action seen on the chart. Volume provides an independent measurement. Volume can be high or low on up moves; high or low on down moves. Huge volume can result in a doji with a close rather near the open or in a large-range day. Therefore, many market pundits such as those employing volume/price-spread analysis a la Tom Williams watch pure volume patterns closely. Many others look for indicators that include inputs related to volume and price action. The Money Flow Index (MFI) and OBV satisfy the needs of some of those seeking inputs independent of each other. To calculate OBV, each day's volume is either added to or subtracted from a running cumulative total. If the closing price was higher than the previous day's, the volume is added; if lower, the volume is subtracted. Introduced by Joe Granville in a 1963 book, GRANVILLE'S NEW KEY TO STOCK MARKET PROFITS, the indicator operates on the theory that volume tends to lead price action. Due to the way OBV is tabulated, a rising OBV indicates that more volume is produced on up days, while a declining OBV indicates that heavier volume occurs on down days. The actual value of OBV may not be as important as its direction. The general idea is that the OBV and price action should be headed the same direction. When they're not, the divergence suggests that big money might be either accumulating or distributing stock. 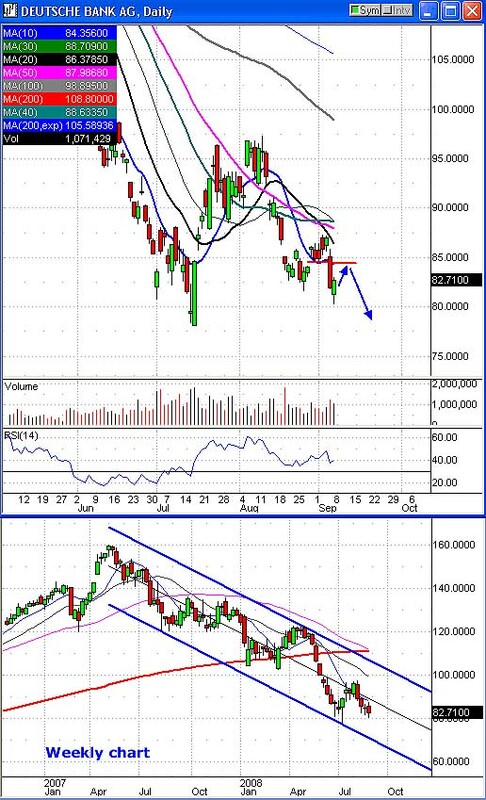 Such divergences alert traders that price may break out in the direction the OBV is diverging. Or so it works most of the time. 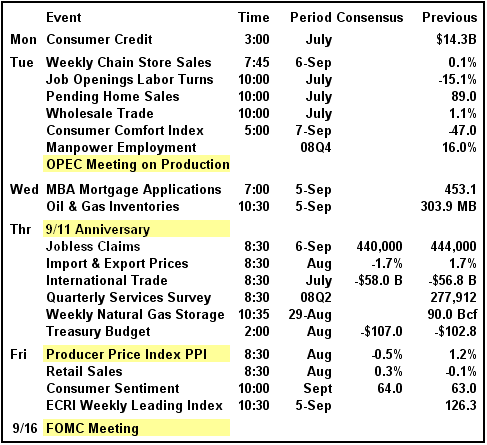 So, what happened in June, 2007? Why did OBV give a false signal? Perhaps it didn't. Prices did break higher for a time before the steep decline. Perhaps the fault lay with the default settings chosen for the OBV. There's no right or wrong setting for an indicator, but generally, the shorter the setting, the quicker the signal but the more likely than signal is to be false. Traders employing a signal built on five periods might see an earlier signal, particularly important to traders seeking a leading indicator, as many consider OBV to be, than one employing a signal built on twenty periods. The tradeoff for the earlier signal is more signals, some of which will be false. Choosing between faster but less reliable signals and smoother but more reliable ones always presents traders with a conundrum. Since I tend to use any indicator as a warning to start preparing my what-if plans and not for trading signals, I tend to opt for the quicker but less reliable option. Those who trade based on indicator signals alone, not a wise choice in my view, might prefer the longer setting and the more reliable signals. Perhaps the problem didn't derive from the settings chosen but from the interpretation of the signal. For example, two new green trendlines can be added to the above chart. Which one describes the real situation? The chart was originally snapped on 8/29/08, so that we could benchmark what was being seen at that time and compare it to what happened by the time this article was published. My charts show a red slider on the bottom when they've been scrolled back, so it's always easy to check whether the chart has been scrolled back or was snapped at the time being covered. Adding a second indicator such as the RSI can help clarify the interpretation. RSI also broke below the dark green trendline but has not yet broken above the light green one, hinting that the correct interpretation might be that of an OBV breaking below support rather than up through resistance. The interpretation that seems most likely here is that the OBV broke through support and has now risen into a possible "kiss goodbye" test, with the former support now holding as resistance. Perhaps something similar would have been found if we could go back to last June and watch OBV and RSI as the lines were originally played out and not as the subsequent action repainted them. RSI happens to be one of those indicators derived from price alone. Combining OBV with volume might provide some clues. Some will argue that volume almost always decreases in the summertime, and decreasing volume during the summer months proves nothing. That's a view that's been espoused recently, for example, but other summer periods sometimes disprove that theory. 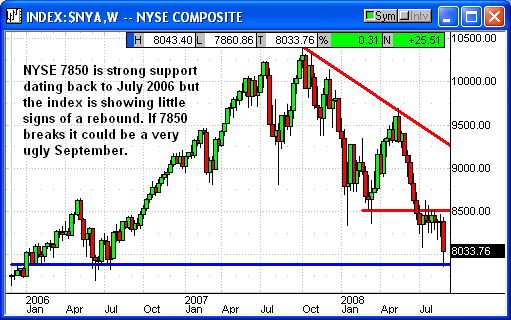 So, these charts snapped as of 8/29/08 were suggesting some caution about what happens next. Depending on what happened with OBV, whether it turned down from that "kiss goodbye" test or continued higher, my old friend OBV was perhaps whispering that a downturn could be coming. Who knows? Maybe last year, the OBV was telling the right story and I wasn't listening closely enough. At any rate, I'm not ready to give up this friend, who tells the tale independent of what price might be doing. Play Editor's Note: This remains a bear market. However, after a week of steady selling pressure this weekend's news regarding a government bailout for FRE and FNM could spark a big short-covering rally. Bear market rallies tend to be fast and sharp. I'm expecting a three or four day bounce and then we'll start looking for new bearish candidates if conditions have changed. More conservative traders will want to strongly consider an early exit for any of our bearish plays especially if the stock produced a bullish "hammer" candlestick on Friday. FYI: Keep an eye on Wal-Mart (WMT). It might be a buy here or on a breakout over $61.00. CLF is bouncing sharply from a test of technical support at its rising 200-dma. 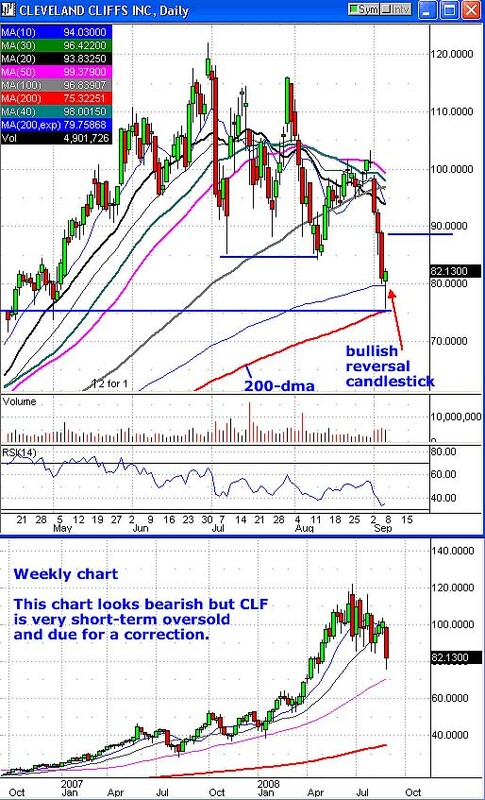 The stock looks short-term oversold after a painful week of selling that took CLF from $101 to $76. There is plenty of room here for an oversold bounce. 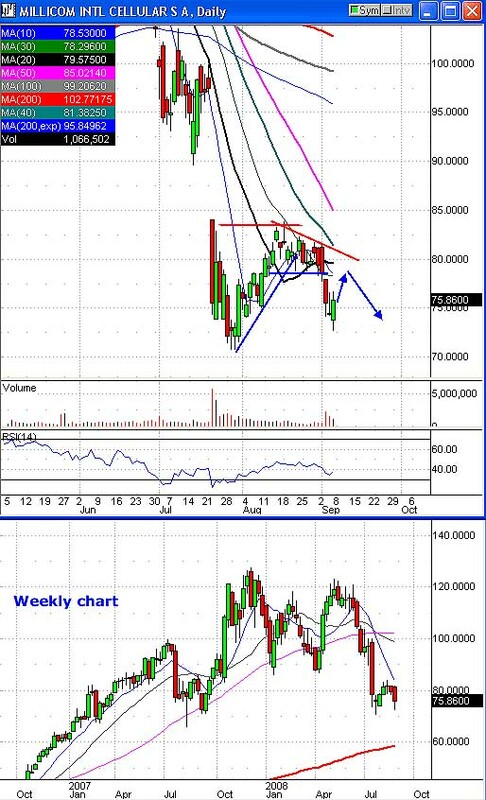 We're suggesting call positions now with CLF over $80.00 and a stop loss under Friday's low. 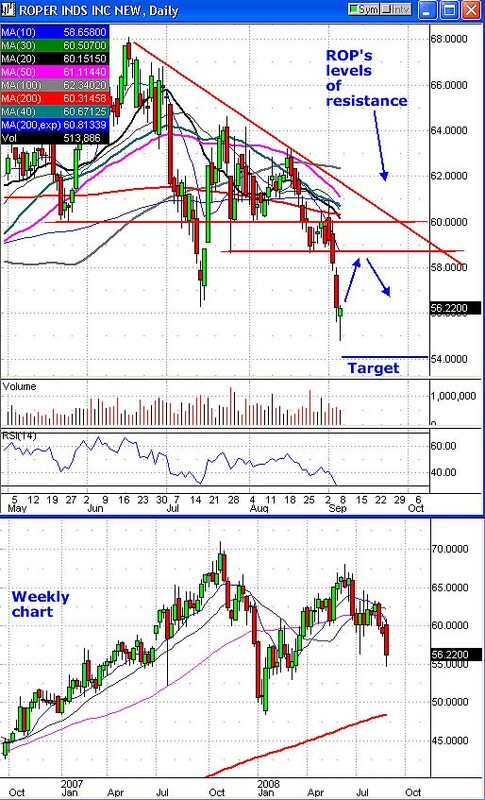 Our target is the $89.00-90.00 zone. We are suggesting the October calls. However, this should be a short-term play and aggressive traders could probably use September calls instead. 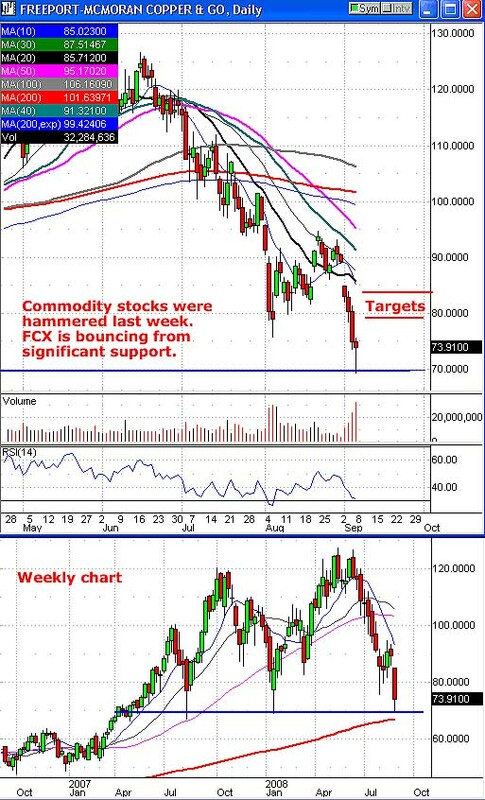 The two-month trend in FCX is bearish and this past week the stock just got crushed with a drop from $90 to $69. Volume accelerated all week into what might be considered a selling climax on Friday with 32 million shares trading. FCX produced a big bounce after testing its January 2008 lows. This looks like a good spot to speculate on a bounce in FCX. We are speculating and FCX should be considered a higher-risk play. If the U.S. dollar continues to march higher this week it will put more pressure on commodities and everything that FCX mines will get pushed lower and the stock could follow. We have two targets. 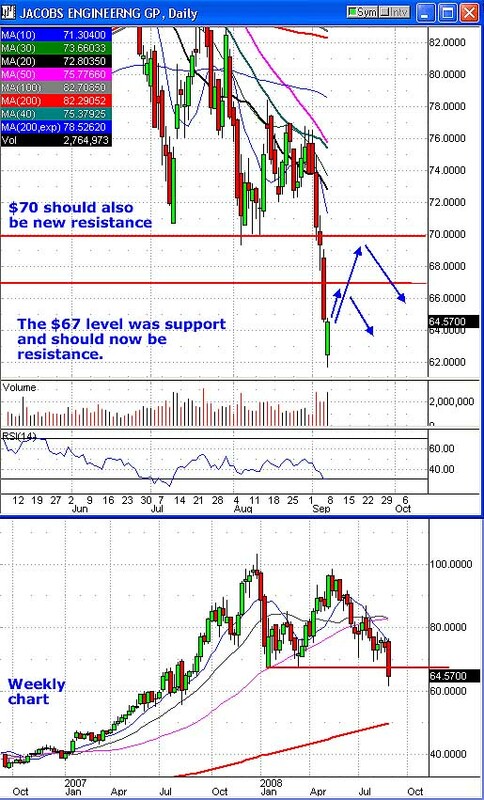 Our first target is $79.75. Our second target is $84.00. We are suggesting the October calls. It is up to the individual trader to decide which month and which strike price best suits your trading style and risk. The financial sector looks poised to rally on the FRE/FNM news over the weekend. 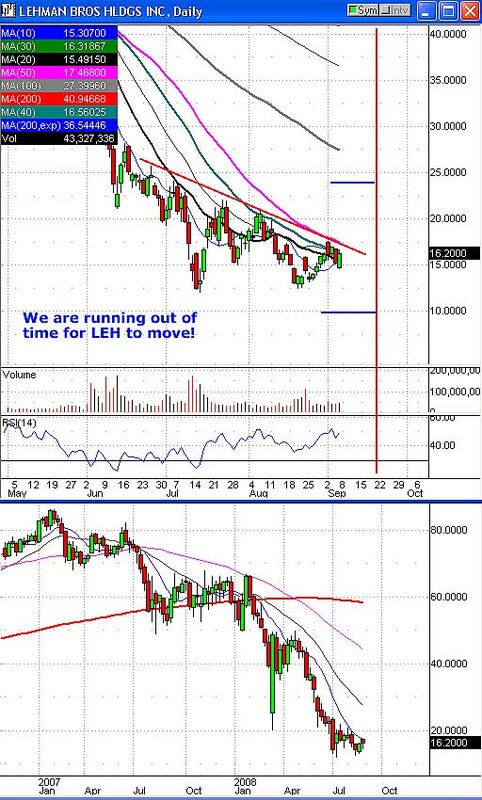 JLL, while in a bearish trend, could see some short covering. The stock is bouncing from a test of the $49.00 level and the close on Friday looks like an entry point to buy the bounce. We're suggesting a stop under Friday's low. We're listing two targets. Our first target is $54.95. Our second target is $59.00. FYI: We would consider this a more aggressive play because option volume is light and the option spreads are wide. We are suggesting the October calls. After months and months of hearing about our economic slow down it is a surprise to see the retailers showing so much strength lately. It could have been a back-to-school rally but most of the news has suggested that back-to-school sales were a dud. That hasn't stalled the bullish trend in shares of KSS. Traders bought the dip again on Friday. 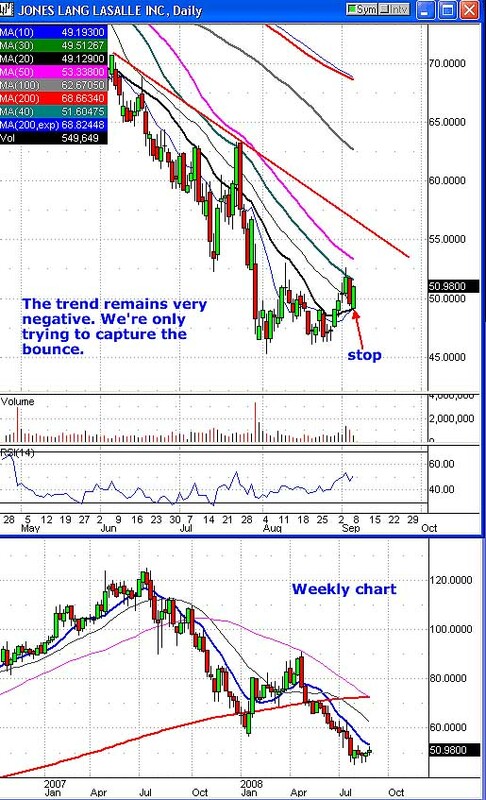 We're suggesting readers buy the bounce with a stop loss under Friday's low. There is resistance near $52.50 but KSS should be able to power through it this time. Our first target is $55.00. We're considering a second, higher target. The P&F chart is bullish with a $62 target. If KSS can trade over $53.00 it will produce a new triple-top breakout buy signal. The insurance-related financial stocks have been showing some relative strength lately. Now that we think the financials might see a rally this week the insurance stocks could be a good way to play it. PRU looks bullish given its breakout from the consolidation phase a few days ago plus the bullish breakout over its 200-dma. The P&F chart is already bullish with a $100 target. We're suggesting readers buy calls on Friday's bounce with a stop loss under Friday's low. Our target is $84.75. The VIX spiked to 24.71 intraday but the fear index reversed as stocks bounced midday on Friday. 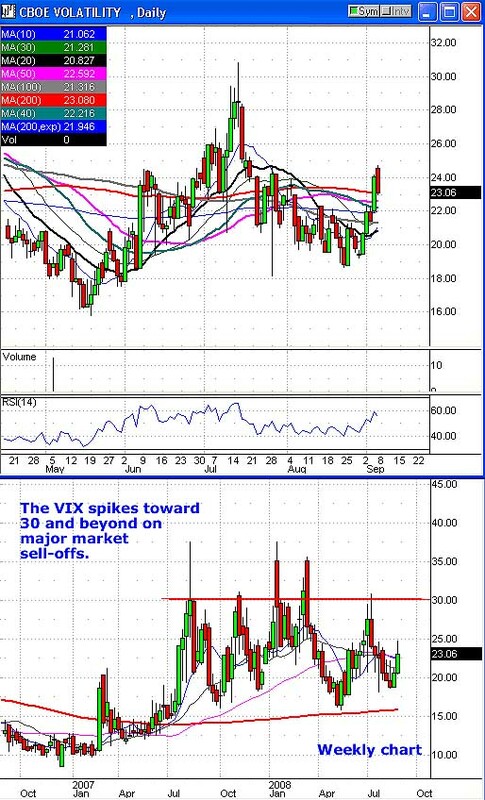 A dip back toward the 22.00 region might be an alternative entry point to buy calls on the VIX. Or readers could just wait and watch for the market bounce to stall and roll over and use that as a new entry point to buy calls. Our target is the 29.75 mark but readers might want to consider scaling out of positions in the 28-29 region. We have been suggesting the October calls. Traders need to make a decision on APD. Do you exit now or endure what appears to be the coming bounce? The stock slipped to $84.87 on Friday morning but the bounce back has produced a "hammer" style candlestick, which can be interpreted as a bullish reversal pattern. More conservative traders are going to want to exit right now. 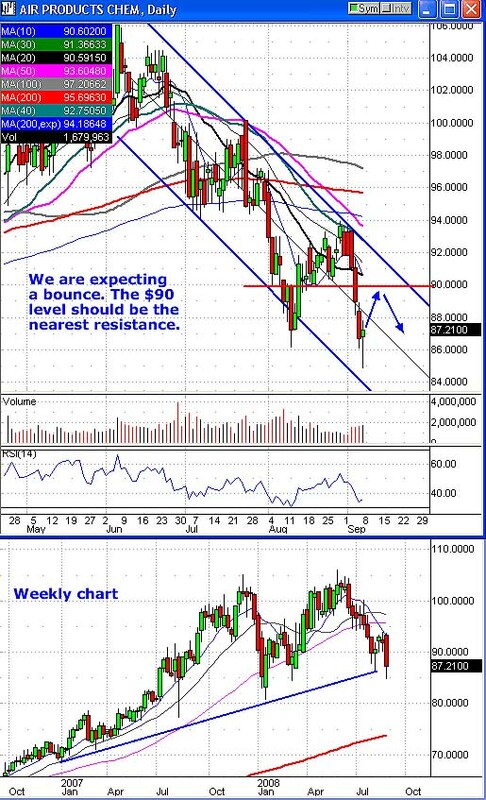 I would expect APD to rally back to the $90.00 level, which should be overhead resistance. We'll try and reduce our risk with a stop loss at $90.55. We would only consider new bearish positions on a clear failed rally under $90. APD has already exceeded our $87.00 target. Our secondary target is $84.00. The Point & Figure chart is bearish with a $73 target. Shares of German bank, DB, dipped to $80.34 and bounced. Yet the bounce was weak compared to the rebound in U.S. banks. It is certainly possible that European markets could rally Monday morning in response to the sharp bounce on Friday and the FRE/FNM news over the weekend. If European stocks do rebound that could lead DB to gap open when the U.S. markets open. More conservative traders will want to consider an early exit if you did jump in on Friday. A failed rally under $85.00 could be used as another entry point for bearish positions. Of course our previous suggestion to wait for a breakdown under $80.00 still works. We would expect a bounce near the July 2008 lows in the $78.00-78.50 zone. However, we expect DB to hit new lows. We are setting two targets. Our first target is $76.00. Our second target is $71.50. The Point & Figure chart looks very bearish with a $66.00 target. If DB provides another entry point we would use the October puts. It is up to the individual trader to decide which month and which strike price best suits your trading style and risk. JEC dipped to another new 52-week low on Friday. Shares hit $61.73 at its worst levels but then rallied back to almost unchanged on the day. We would expect some follow through on this bounce. If you don't want to endure the rebound then consider an early exit right now. You could always jump in again on a failed rally under $70. Broken support near $67.00 should be the first line of defense for the bears. We would not suggest new bearish positions until JEC's rebound begins to fade. Our target is $60.50. FYI: The Point & Figure chart is bearish with a $47 target. We are not suggesting new positions at this time. If JEC provides another entry point use the October puts. Uh-oh! LLL delivered a pretty big bounce on Friday following Thursday's bearish breakdown. We had been waiting for a break under support with a trigger at $102 to buy puts and that occurred on Thursday. 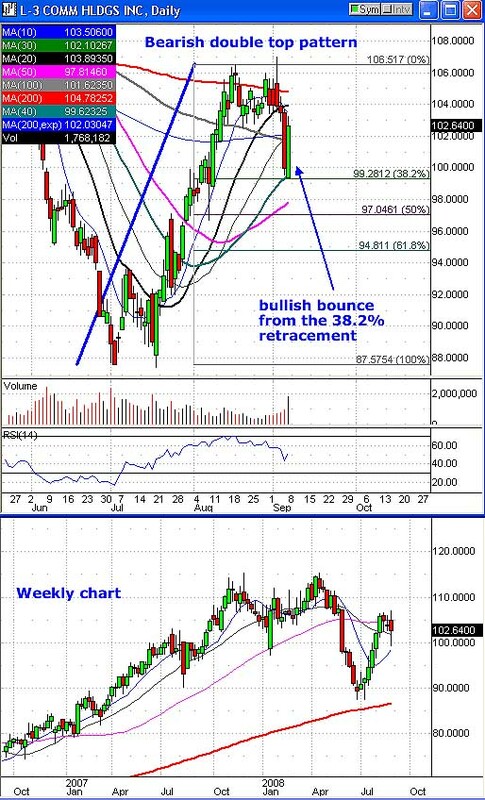 LLL rallied hard on Friday with a bounce near its rising 40-dma and its 38.2% Fib retracement level. You could easily argue this is a bullish reversal and that Thursday was just a bear trap. More conservative traders will want to consider an early exit to limit your losses. 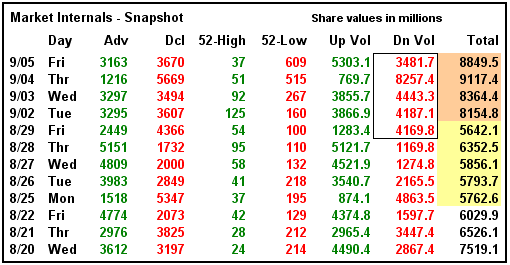 What makes this even more scary for the bears is the strong volume behind Friday's gain. It looked like the rally was starting to stall on Friday afternoon when the rest of the market was bouncing. We're going to stick with our play as it is with a stop loss at $105.05. We're not suggesting new bearish positions at this time. 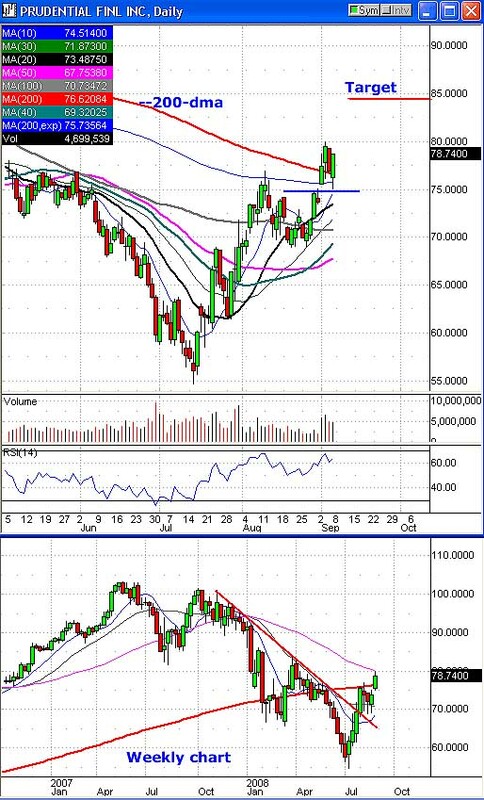 Our target is $97.50 or the 50-dma (currently 97.37). Broken support near $102.50-103.00 should now be new resistance. We are not suggesting new plays at this time. MICC dipped to $72.75 before bouncing back into the green on Friday. Our secondary target is $72.50! The bounce may not be over yet. Friday's session produced a bullish engulfing candlestick pattern. Readers can watch for another failed rally under $80.00 as a new entry point for bearish plays. We are adjusting our stop loss to $80.51. The MACD on the daily chart is very close to a new sell signal. The P&F chart is bearish with a $63 target. 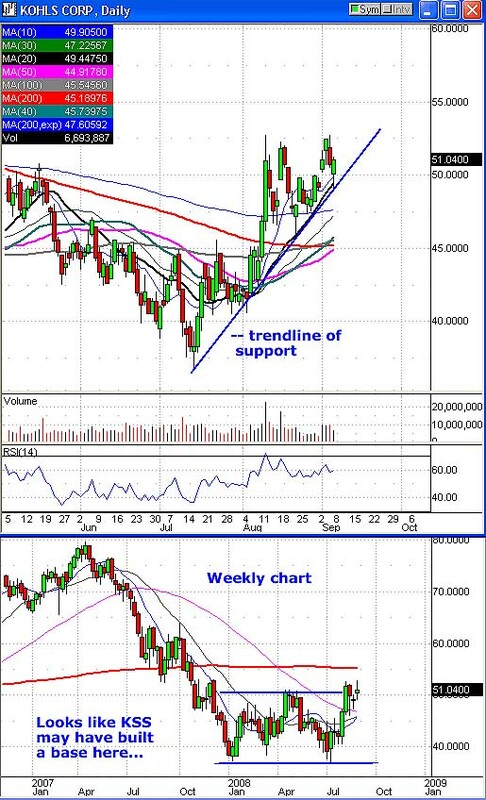 If MICC provides a new entry point we would use the October puts. More conservative traders should consider an early exit in ROP right here. The stock dipped to $54.80 and bounced back sharply. The move has produced a "hammer" style candlestick, which can be interpreted as a bullish one-day reversal pattern. Our target was $54.25. We are expecting a bounce from here. Shares could easily rally back to what should be resistance in the $58.50 region. We're adjusting our stop loss to $60.05. A failed rally under $60 can be used as a new entry point for puts. FYI: The Point & Figure chart is bearish with a $45 target but the P&F chart also shows some support near $53.00. Banking stocks from around the world rallied sharply from their lows on Friday afternoon. UBB slipped to $103.53 before bouncing. 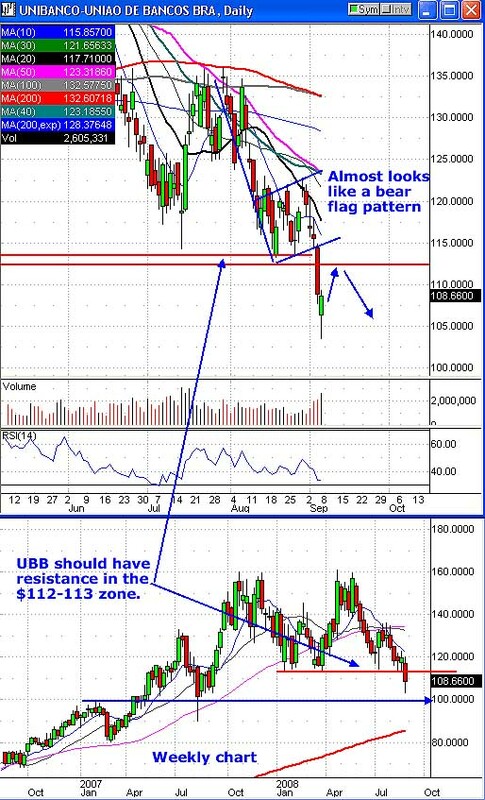 It would not surprise us to see UBB challenge previous support as resistance in the $112-113 zone. If you do not want to endure the bounce back toward $112 then consider an early exit right here to cut your losses. You can always jump back in around $112-111 after the bounce begins to fade. We have two targets. Our first target is $100.50. Our second target is $92.50. The Point & Figure chart has produced a brand new triple-bottom breakdown sell signal with a $92.00 target - a target that will probably move lower. The stock can be volatile so readers should consider this a higher-risk play. Wait for the failed rally before considering new positions. We are suggesting the October puts. Rumors and speculation continue to fly about just who might be in talks with LEH to buy all or a part of their company. LEH is desperate to raise capital as they try to de-leverage their balance sheet. On Friday there was talk that Blackrock, KKR and Japan's Nomura Holdings were all considering some sort of action with LEH. LEH rallied from its lows near $14.60 and closed up 6.7%. We are quickly running out of time. We only have two weeks left before September options expire. LEH needs to do something quick. We need to see LEH significantly above $24.00 or under $10.00. The options we suggested were the September $24.00 calls (LYH-IR) and the September $10.00 puts (LYH-UB). Our estimated cost is $2.15. We want to sell if either option hits $3.50 or higher. We are not suggesting new strangles in LEH at this time. © 2008 , RightSide Advisors, Inc. All rights reserved.